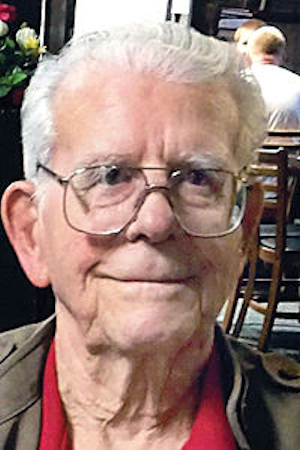 Obituary – VanBebber, Earl Martin « Perry High School Alumni Association, Inc.
Services will be March 12 for longtime Tracy, California resident and business owner Earl Martin VanBebber, who died Saturday at Sutter Tracy Community Hospital after a short illness. He was 96. Mr. VanBebber, called “Van” by those who knew him, came to Tracy in 1948 and with his wife purchased property on Grant Line Road. He established Van’s Trading Co., which in the 1960s became Van’s Ace Hardware. Born on May 10, 1918, Mr. VanBebber was the youngest of 11 children born to Francis and Ila VanBebber in Perry, Okla., a small town in the north-central part of the state. His family farmed wheat and corn, as well as raising cattle and turkeys. After graduating from Perry High School in 1938, he attended Oklahoma State University for three years and, in his junior year, won the 1941 National Collegiate Athletic Association wrestling championship at 155 pounds. He and his OSU Cowboy teammates won that year’s NCAA national wrestling title. One of his older brothers, Jack VanBebber, won the freestyle wrestling welterweight gold medal at the 1932 Olympics in Los Angeles. In the early 1940s, Mr. VanBebber moved to California to get work, coming here with only about $20 in his pocket. Mr. VanBebber moved to Redwood City and worked in military ship-building in San Francisco during the Second World War, starting as a welder and becoming the foreman of a crew. When he finished his ship-building work, he was drafted into the U.S. Army and sent to a military base in Washington state, where he helped train troops for combat. In addition to operating Van’s Trading Co. — later Van’s Ace Hardware — he was co-owner with Wes Hogle of Arrow Equipment Rentals in the 1960s and ’70s. After retiring in the 1980s from active retail business participation, Mr. VanBebber continued to be involved in commercial and residential real estate development. One of his friends in the ship-building industry introduced him to Mildred Louise Simpson, whom he married in 1943 and who was his wife for 61 years until she died in 2004. In the 1950s and ’60s, he and his wife were members of the Tracy Twirlers square-dance club and were members of local bowling teams. The couple took a number of cruises to Mexico, Jamaica, Hawaii and Alaska. Mr. VanBebber was a member of the First Baptist Church for more than 35 years and assisted a number of local charities and churches. Surviving are two sons, Richard VanBebber, and his wife, Alicia, of Tracy, and Jack VanBebber of Pacific Grove; two grandchildren; and five great-grandchildren. Visitation at Fry Memorial Chapel, 550 S. Central Ave., will be from noon to 9 p.m. March 11. March 12 services will begin at 1 p.m. with a graveside service at Tracy Cemetery, 501 E. Schulte Road, followed at 3 p.m. with a celebration of life and reception at the Portuguese Hall, 340 W. Ninth St. Contributions in his honor may be given to the First Baptist Church, 1935 Holly Drive, Tracy, CA 95376.